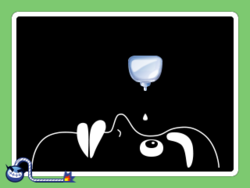 Dry Eye is a microgame in the Strange folder in WarioWare, Inc.: Mega Microgame$!. The microgame later appears in WarioWare: D.I.Y.. A remake of the original version is included in WarioWare Gold, once again under Mona's stage. There is a woman's head rested horizontally along the bottom of the screen, and a bottle of eye drops moving back and forth above her face. The player must press the button when the bottle is directly over her eye to land a drop in it. As the difficulty level increases, the bottle gets higher, and the woman's eye gets narrower. 1st level difficulty: The eye is wide and the dropper is a short distance to it. 2nd level difficulty: The eye is reduced 1/3 smaller, and the dropper is raised at a medium distance. 3rd level difficulty: The eye is reduced 2/3 smaller, and the dropper is raised very high above the screen. In WarioWare Gold, the microgame sometimes replaces the woman with a robot that must destroy the bottle with laser beams shot from its eyes, which is a recreation of another microgame from Mega Microgame$!, Laser Vision. Info "My eyes are so ITCHY! Help!" To win the game, the player has to squirt the eye drops into the woman's eye by tapping the bottle. However, they have to squirt it when she opens it or else they'll lose. Also, if the liquid is squirted somewhere else on her face, they'll lose the microgame. The person in the WarioWare, Inc.: Mega Microgame$! version of the microgame makes a cameo in the Eye Exam microgame from Game & Wario, where he is seen holding the same eye drop bottle, albeit with the same colors as the one from WarioWare: D.I.Y. This page was last edited on March 9, 2019, at 22:58.